This sleek, frameless wall mirror with chrome hardware seems to float in front of the wall. A stylish, minimalist, rectangular wall mounted mirror that hangs from four round, solid brass, chrome finish brackets. 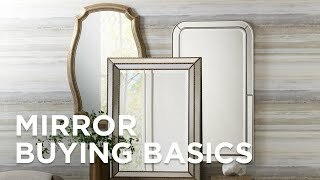 Brackets extend from the wall, giving the mirror a "floating" look. The frameless, non-bevel edge design makes a wonderful, contemporary accent for your bath or dressing area. From the Gatco Zone mirror collection. 4 solid brass brackets in chrome finish.